These procedures are a predictable way to cover unsightly, sensitive, or exposed root surfaces and to prevent future gum recession. If you are unhappy with the appearance of short unsightly teeth this can be greatly improved by a combination of periodontal procedures by Dr. Roane and cosmetic dentistry by your dentist. 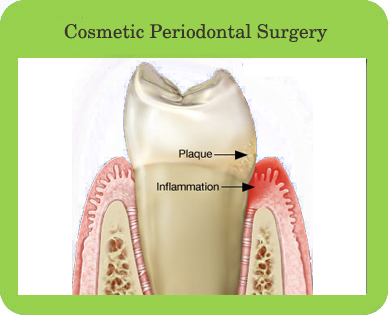 During this procedure, excess gum and bone tissue are reshaped to expose more of the natural tooth. This can be done to multiple teeth, to even your gum line, and to create a more beautiful smile. Bone grafting, following tooth loss, can preserve the ridge and minimize gum and bone collapse. There is less shrinkage and a more aesthetic tooth replacement for either a dental implant crown or fixed bridge around the replacement teeth.